Sea: A few white caps out there; swells in 1-3 foot range — easy going today. A fairly exciting morning on the longline. Several escolar, a barracuda, and a pomfret (a laterally flattened fish about 30cm long but only 2-3 cm in width with a fine set of sharp teeth). Samples taken from all. We also had a blue shark from which samples were taken and an oceanic white tip shark which was tagged and released. I got to wrestle both. Picked up a few remoras from the sharks. We think we have at least two species of remoras. This afternoon we passed over Cross Seamount and traversed it several times as we trolled but to no avail. There will be no longline set tonight since we have a date in Kona to drop off one of the current scientific party. I want to fill in with more of the vision story this evening if I can stay coherent long enough to convey it sensibly. I will touch on the work of Steven, Kerstin, and Rickard. I have been collecting samples of fish lenses. They vary in size, as you would expect, among different sized fishes. What makes the lenses different from those of most vertebrates is that they are spherical rather than oval in cross section. The cornea of fish is also optically non-functional. Since it has the same refractive index as water, focusing is done by moving the lens back and forth in the eye rather than by changing the shape of the lens as our eye muscles do. Steven uses laser light to determine the focal point for different colors of light. He suspends lenses in a fluid medium then turns on a laser beam that makes two vertical passes through the diameter of the lens. You can watch light’s path change as the beam migrates. Computer analysis then determines focal point. Kerstin and Rickard must have live cells from the retina for their studies. Among other things, they are looking at the sensitivity of these cells to different light intensities. Live retina cells convert light to electrical signals which travel via the optical nerve to the brain to produce an image. By attaching electrodes to tissue samples about 1 cm square in size and subjecting the cells to different intensities of light electrical responses of different strengths can be detected and measured. They appear as a wave pattern on a screen. As light intensity is increased, the amplitude of the wave pattern increases. So a flat line (no response) becomes one with small amplitude waves which grow as light intensity increases to a point where more light produces no greater effect. Lets compare two species, mahi mahi, which stay nearer well lit surface and bigeye tuna which like deeper environs. Which eye would you expect to be more light sensitive? The bigeye. Their cells are stimulated by much lower intensities of light than the mahi’s. They (bigeye) have to be able to detect their prey under minimal light conditions and need the more sensitive eye to do that. Big eyes, big pupils (fish pupil size is fixed) and a “super” sensitive set of retinal cells are adaptations of these fish to their deep environment. I’ve had enough (as I suppose you have too). I will wrap up the vision story tomorrow or Sunday. We are headed for Kona. Although we probably will not get any shore time, it has been suggested that there might be an excursion to a place where we can swim/snorkel for awhile. I am hoping very much this it true as are others. A plunge into this element (I guess I should say compound) that we have bobbed around on top of for the past 13 days would be a pleasant change in the routine and scenery. Reading E.O. Wilson’s The Diversity of Life. I would like to thank, Ron, a fellow teacher from Michigan who I have never met, for writing a note to tell me that he has been enjoying the logs and also to pose a question. Much appreciated! Sunrise here today is at 6AM and the great yellow ball sets here at 7PM. What time is it rising and setting in your area at this time of year? Find out sunrise and sunset times for the solstices for Honolulu and your area. From that determine A) how much longer the sun is above the horizon for each place in summer vs winter B) which place, Honolulu or your home has more sun time at each solstice? If you find that there are differences explain why they exist. Sky: Somewhat overcast this morning but a nice sunny day overall. Sea condition: Good sized swells today kept us rocking and rolling pretty good throughout the afternoon and evening. But it wasn’t discomforting at all. Brought up 3 escolar and one wahoo on the longline this morning — not a very exciting time. The set was about 30 miles NE of Cross seamount. After retrieval we steamed south again through/over Cross and back to the area of success around Swordfish seamount to set the line tonight. Along the way we encountered several so called “bird piles”, congregations of birds on the water, indicative of fish below. Passing over Cross we pulled in 5 mahi mahi, a small yellowfin tuna, and 4 bigeye tunas. It was a busy late afternoon. There’s lots of fish on ice for upcoming meals! This afternoon Eva gave me the tools and an escolar eye and had me go through the procedures she follows to get what she needs for her studies. (Kylie basically does the same procedure but uses skipjack tunas). I’m not ready for microsurgery yet, but she gave my effort a thumbs up as I successfully secured the materials she needs for later study. As the eye is taken from the animal marks are made on it with a scalpel to mark its orientation in the animal. After measuring eye cup and pupil size, the cornea and lens are removed and a bit more scraping and cleaning eventually leaves her with optic nerve, retina and vitreous to be preserved. This took me about 45 minutes to do. Back at her university lab, the retina alone will be used. Sections of the retina will be mounted for microscopic examination. With it she can answer questions such as 1) what do the photoreceptor cells look like? 2) Is there a variety of types of receptors in their eye? 3) What is the density/distribution of receptors across the retina? In another study she makes other preps for microscopic examination to observe density of ganglia in the retina. I had some ideas for tonight’s entry in this section, but this boat is rocking pretty hard right now and sitting in front of the computer is not particularly pleasant. I’m cutting things short tonight. Sky: Sunshine with scattered cumulus; beautiful day. Sea: A few white caps tonight. What might they foretell? Pretty good day on the line. We tagged a yellowfin tuna (on board) and a broadbill swordfish (in the water). In the latter case, the tag was attached by sort of harpooning it into the animal from deck. We also pulled in a snakefish (head only), a big eye tuna, 2 escolar, a barracuda (of no interest so simply cut off the line) and 3 blue sharks. One was too large to safely bring aboard; it was cut loose. The two others were brought on board. From one we took blood and fin clips after which it was released. One fish was brought in by trolling today. As you have noticed water temperature here would be quite comfortable for us (but we are not taking afternoon swims). Rich explained to me that here there is mixing of the surface layers such that the surface temps. I have been reporting would apply to a depth of about 100 meters. Then between there and 400 meters we would see about a 10 degree C drop. While some fish stay in the upper layers others hang in the depths or make regular vertical transgressions across these zones. Fish are generally regarded as having body temperature at or very near ambient. Any heat produced in the muscles by aerobic respiration is picked up by the blood and circulated through the gills where that heat is dumped efficiently to the environment. Some saltwater fish (no freshwater ones) including tunas and some sharks have developed a kind of heat exchange system. Heat from venous blood is passed to arterial flow in order to keep certain muscles and organs above ambient temp. by as much as 20 degrees C in large fish. This allows body tissues and organs to work more efficiently. Those oily escolar are not being kept for consumption. This morning we took one’s eyes and made a short incision along the belly just to take some muscle tissue In returning the escolar bodies to the sea I have scored their diving entries 1-10 as in competitive events. Most have been dropped straight in, but this morning I thought of trying something with a higher difficulty factor — a one and half back flip with tail entry. But on its first rotation, a bit of the entrails was ejected shipward striking me on the shoulder before falling to the deck. Unfortunately, this was not captured on film for replay tonight on “Funniest Ship Videos”, but for those present, it provided a good bit of humor to start the morning. Hereafter, we might just stay with the less ambitious dives. Spectators were glad it was I and not they. Later I made my debut as a shark wrestler. As a rookie I was given the tail end. Even though the blues are comparatively tame once on board, the strength in the animal’s body was very evident as it tried to move – – not so sure I care to deal with the other end of these babies! 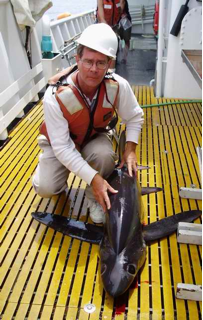 TAS Geoff Goodenow and a blue shark. This question relates to paragraph two of the science log. What is the thermocline within a body of water? How would you expect a temperature profile to change through the seasons in a deep lake in central Pennsylvania? Any questions from you folks??? The longline brought in just two escolar (Lepidocybium flavobrunneum), an oily tuna (not ones we keep for eating) that tends to live rather deep. It is a dark colored fish unlike the shallower water tunas and mahi we have brought up which are nicely (sometimes brilliantly) colored. Its eye is very large and reflective like a cat’s eye though silvery. It is quite striking. So anyway, a bit of excitement there, and I got to see a species new to me. I don’t think I gave any description of the longline retrieval yet. The ship maintains a course to keep the line perhaps 30-40 degrees off port side. The line comes up midship over a pulley at the spool and is wound onto the spool. As leaders come up they are unclipped at the pulley and passed to others who remove bait and return hooks, leaders and clips to storage barrel. If a fish comes on, the spool is stopped until it is landed and removed from the retrieval area. It is a challenge for crew on the bridge to maintain the proper course for the ship with respect to the line. Because the ship is moving slowly during the process and the process must be stopped for fish or entanglements, recovery of the line takes much longer than the set. I don’t think we’ve done it in less than 2 hours. Nothing came up by trolling today and no plankton tows were done. Tonight we are south of Cross Seamount (at 2000 we are at 18 08 N, 158 27 W) to set the line. Again we are not at Cross because of another boat’s presence. I’m the starter on the bait box tonight. I hope I can fulfill the duties, after all I’m a rookie and used to coming in only as the closer so far. I guess they’ll try anything to change our luck. After completing my log last night at about 2030 I went to an upper deck where we have strung a hammock. I was a beautiful starry night — the clearest we have had. A warm gentle wind blew over a sea rolling under us as one foot swells. The bright orange waning gibbous moon rose 20 minutes later a cast its long shimmering light across the water as it rose higher. The Big Dipper was easily apparent pointing toward Polaris only 18 degrees or so above the horizon. As new constellations took their place above the eastern horizon a couple of meteors streaked by. I was reluctant to leave the scene for my cabin. I made the mistake of telling folks about it today; there could be some competition for that hammock tonight! In preparation for upcoming editions of the log I spent an hour or so with Kerstin discussing her work with vision in these pelagic fishes. Wow! I’ll be sorting that out for awhile — very interesting stuff. I finished a book, The Great Biologists, written in 1932. Obviously many more recent greats are not included, but I enjoyed reading about the men included from a 1932 perspective. It is of interest to me to learn more of the impact of particular work at its time in history and of the personalities of the men themselves. It adds some new dimensions to teaching of biology that might captivate a few students as bits and pieces can be appropriately included. We had a small group of dolphins leaping high as they passed the boat. Flying fish are a common sight; crewmen report that often they are found on deck in the morning. We have a pair of birds, a type of booby I believe, hitching a ride with us. They are leaving their mark all over the bow which is not pleasing the crew and have thus been dubbed “John’s nemesis”. But for those of us who don’t have to swab the deck, it is neat to have them around and to watch them feed. From their perch they seem to spot a fish leap from the water and take off. They follow the fish 10-20 feet over the water as it swims and at an instant make a fast dive for it and quickly take flight again. Many of us had our supper on the deck tonight — my first mid-ocean picnic. A clear horizon at sunset gave me another view of the green flash. Venus (I think) set about 2135 just as set of the longline finished. And as predicted, there is a crowd gathering on the bow for moonrise. There is no “south pole star” as we think of Polaris as our “north pole star”. How can you use the Southern Cross to point you in the direction of the south pole?